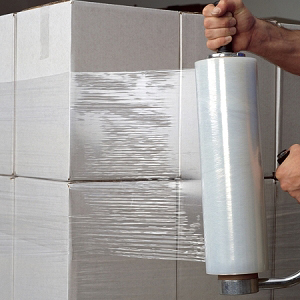 Stretch Wrap or Stretch Film is a plastic stretch wrap film typically wrapped around pallets to contain shipments during transit. This film comes in an enormous variety of thicknesses, widths, colors and formulations. Companies that are looking to see a significant savings in film usage should consider stretch wrapping with equipment rather than by hand. Stretch Wrapping is easier and safer, while reducing product damage and labor while hand wrapping is a time-consuming and physically demanding operation.. The cost of a stretch wrap machine is easily justified with cost savings gained. A stretch wrap machine is excellent business sense…production rates go up, labor costs go down, wrapping is more consistent and there is more quality control over the wrapping process to ensure damage free distribution.